A cheap parlor trick wrapped in a beautifully made package. Made for diCaprio fans will love it, Scorsese fans will go either way depending on if they buy it or not. There’s just something about islands. The seclusion created by an island conjures up feelings of loneliness and at times paranoia. There’s one way on and one way off. Things can get creepy on an island. I guess that’s why it’s the perfect place for a mental institution for the criminally insane. Shutter Island, located off the coast of Boston, is home to 66 prisoner patients. Basically all of them murderers with the only differential being the increasingly bizarre ways they killed whomever they killed. U.S. Marshal Teddy Daniels (Leonardo DiCaprio), and his partner Chuck (Mark Ruffalo) have been sent to the facility to investigate the disappearance of one of the inmates. Seems as though the prisoner, who is said to have drowned her three kids, has vanished into thin air. DiCaprio is a force here. He’s perfect as the strung out U.S. Marshal who may have a secret agenda to pull off during his investigation. Teddy’s fear and paranoia are ever-present on DiCaprio’s continuously furrowed face. A master actor at work. Daniels is battling his own inner demons. A decorated soldier in World War II, Daniels was there when they freed the prison camps. The horrors and atrocities, images of piles of bodies, play over and over in his head like a broken movie reel. He can’t forget his time in the Army. He can’t forget the faces of the nameless corpses heaped on top of each other like pieces of trash. Dr. Cawley (Ben Kingsley) is the doctor in charge of the island. Always present during Daniels’ investigation, Cawley keeps a watchful eye making sure Daniels doesn’t overstep his bounds. Right away you know he’s hiding something, but you also know it’s the kind of something you won’t find out until the end. “Shutter Island” is being billed as a straight up horror movie by the looks of its trailers; this couldn’t be further from the truth. It’s sad when Hollywood thinks that what they have won’t sell, so they feel like they need to dress it up as something else. People going expecting a horror movie will be disappointed. This is a psychological thriller, which will at times, make your brain hurt. You know the movie is deliberately hiding secrets from you for its big end reveal, which becomes a little perturbing. Scorsese’s direction is masterful, as always. His score is unsettling, and his camera work top-notch. This could have easily been a movie where things jump out from the dark and scare you, much like last week’s “Wolfman” was. Scorsese instead focuses on the visuals, building suspense by lingering on shots of the bizarre and beautiful. 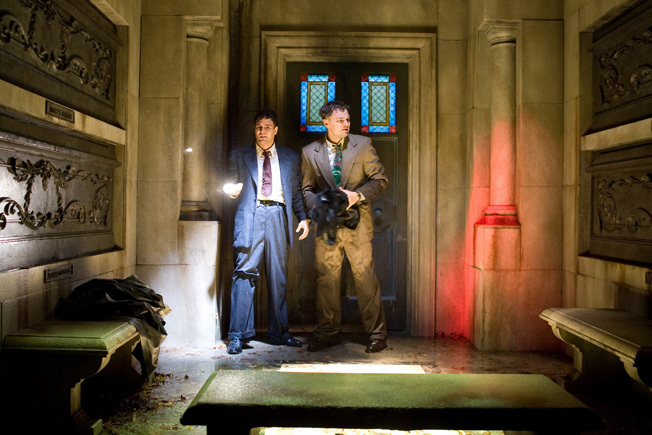 After all that, you may think that “Shutter Island” is one of the year’s best, sadly it isn’t. The entire premise, once laid out, is a sham. The wool has been pulled over our eyes, and for an hour or so we believe it, but when we find out what’s really going on we realize that the entire story hinges on a string of convenient coincidences. After the curtain is pulled back, and we see what’s going on behind the scenes, it’s not suspenseful, masterful, or even the least bit creative. The movie as a whole collapses under its own weight. The oldest trick in the book really, and we were duped. It’s sad that a magnificently directed, cleverly written, and brilliantly acted film like this one could turn out so mundane and unoriginal. Eagle-eyed viewers may be able to catch onto the story and realize what is happening, I have to confess I had an inkling, but didn’t want to believe it. I wanted it to be something more than what it is. Something more than what we’ve seen in psychological thrillers like this time and time again, but it isn’t. It’s nothing more than a cheap trick wrapped in a beautifully made package.